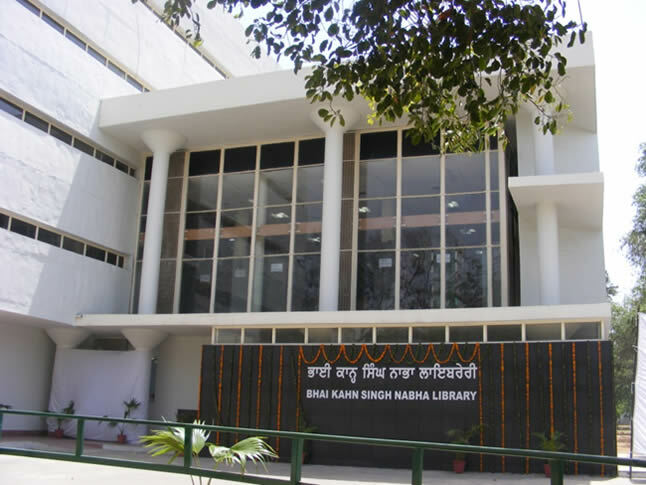 Bhai Kahn Singh Nabha Library University Library is a hub of academic and research activities. It is housed in a spacious air conditioned building and kept open for 360 days of the year from 8:15 am to 8:15 pm. It has total of 480759 books, 52995 bound periodicals, subscribes to 356 current journals and 22 newspapers. 60 journals are being received on gratis. In addition to this CD's and Microfilms are also available. It has a majestic Reading Hall with a seating capacity of 400 readers. A separate air conditioned Night Reading Hall for using personal books has been provided at the ground floor. It remains open for 365 days from 8:15 am to 6:00 am (next day). Library is being run on modern lines. It has On-line catalogue services. Internet Access Lab has been established for using electronic documents. Library has also photocopy, reference and Inter-Library Loan (ILL) facilities for readers. Bar-Coding of documents has been completed. RFID technology for security and issue/Return of books has been used. Wi-fi facility is available in the library. The library has established departmental libraries in some of the teaching departments and regional centres at Bathinda, Talwandi Saboo, Dr. Balbir Singh Sahitya Kendra Library, Dehradun and Punjabi University B.Ed. College, Bathinda. An Extension Library has also been established at S.A.S. Nagar, Phase -VII, Mohali (Punjab) to meet the requirements of the students and general public. In order to provide security and to avoid the theft of the books, CCTV cameras have been installed in all the four storeys of the library. There are 215 e-books available on Computer Science, Engineering & Business Studies and full text of these e-books is available at the University Campus. 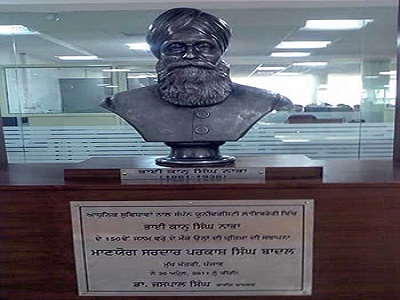 Dr. Ganda Singh Punjabi Reference Library, which is a integral and precious part of the library is housed in a building which is interlinked with the main building. The Library has estabilshed departmental libraries in some of the teaching departments and regional centres at Bathinda, Talwandi Sabo, Dr. Balbir Singh Sahitya Kendra Library, Dehradun and Punjabi University B.Ed. College, Bathinda. An Extension Library has also been established at S.A.S. Nagar Phase-VII, Mohali (Punjab) to meet the requirements of the students and general public. For security and to avoid the theft of the books CCTV cameras have been installed in all four storeys of the library. Bar-Coding of documents has been completed and issue and return of books is computerized. Membership of all the University employees has also been computerized. There are 215 e-books available on Computer Scince, Engineering & Business Studies and full text of these e-books is available at the University Campus. The University has set up a University Computer Centre. It was established in the year 1986 with the assistance of University Grants Commission. University Computer Centre (UCC) is taken as centralised resource facilitator for computerization with an aim to cater to the needs of the entire University. The principal objective of UCC is to provide readily available facilities of computer milieu to students, research scholars, teachers and employees of the University. Its associated objective is also to automate administrative and secretarial wings of the University. It is one among the best in the region in terms of infusing computing resources, campus wide networking and internet facility. Use of advanced featured firewall for checking upon bandwidth abuse. Access to on-line journals, thesis and dissertation repositories in the Campus and NPTEL study material. Wi-Fi hot spots in the main library, hostels and departments. Online Admissions with provision of online payment and feedback through integrated SMS facility. Enhanced Website of the University and facilitator to various branches/ departments. Running PG Diploma Courses in Computer Applications, Web Designing and Networking and Maintenance of computers. UCC emerged as a pioneer podium in the state to extend campus wide Internet facility way back in the year 1996. It extended the facility through thick/ thin Ethernet now currently banking upon robust 20+ km of fibre optic backbone supported through 1 GB fibre/ 10 GB fibre links. The University has dedicated 155 Mbps bandwidth is made available under NKN-NMEICT project of MHRD. Rs. 50 Lac are being incurred on the service being provided for the period of 10 years w.e.f. December 2010. These are 1:1 leased line connection available on fiber links/ Copper links resulting in unlimited 24X7 connectivity. In addition, 20 Mbps 1:1 uncompressed bandwidth for Internet facilities from M/s Quadrant Televentures Limited, Mohali. Rs. 3 (approximately) Lacs are being incurred on the service being provided annually. In the main campus, the facility has been extended to all the departments, administrative branches, hostels, research scholar flats and guesthouses through fiber links. As per policy, non-academic sites are disallowed using academic hours (10:00 am 5:00 pm). The University has about 1500+ nodes on its network. These are hooked to central backbone either through wired links/ Wi-Fi nodes. All the users in the University are authenticated through a Firewall. About 10,000+ users are registered to use the campus Internet facilities on average. On spot Registration of Guests to allow them to use Internet facilities is also provided. A modest video conferencing facility has been set up. Presently, it is on one to one communication. This facility is being intensively used for Online Examinations, PhD Registration and submission Viva-Voce, Interactive Lectures, Placement Interviews and Meetings. The Campus Backbone is primarily being used to access On-line Journals, Library ERP, Net Surfing, Intranet Applications, Online Examinations, Placement of Students, Online Admissions, Hostel Administration and Surveillance. Now the Individual departments are making use of this facility for accessing online resources, electronic formats of theses and dissertations available in the repository of Shodhganga (Inflibnet-UGC), NPTEL study material and many more. Presently, 350+ WAPs have been installed with thin and fat functionality in the Campus to set up Wi-Fi zones in all-important places as main library, hostels, guesthouses and departments in the University. Majority of the students bring their own devices to access the campus e-facilities. To ensure two level security mechanism, WAPs in the hostels are managed using controllers. University Computer Centre is working as Nodal Agency to implement e-Waste Management Rules Management and Handling Rules 2011 at University Level as per the standards laid down by Pollution Control Board; in endorsing Digital India Campaign; in implementing anti-plagiarism software in the University. The Research Centre for Punjabi Language Technology (Earlier known as Advanced Centre for Technical Development of Punjabi language, Literature and Culture) was established in 2004 with the aim of conducting research and development in linguistic and computational aspects of Punjabi Language as well as to spread the usage of Punjabi on computers and internet.Its the only Centre in the world dedicated for Technical Development of Punjabi. The Centre has been successful in bridging the script barrier between communities in South -eastAsia by developing transliteration software forPunjabi, Urdu and Sindhi languages. For the first time many language related software for Punjabi, Hindi, Urdu and Sindhi have been developed, including first word processor for Punjabi and Hindi and video lectures for Punjabi learning have been developed at the Centre.The Centre has been awarded three international research projects in open competitions, funded under PAN Asia Grants Singapore and ISIF grants Australia. Research and development projects worth crores of rupees have been executed by the centre. The Media industry is witnessing a whopping 50% growth rate, while the Indian entertainment industry comprising mainly Television and Cinema is crossing Rs. 50,000 crore mark. With opportunities in the Print Media now having reached a saturation point as far as lucrative jobs for the students are concerned, Television channels on the other hand are mushrooming at an unprecedented pace without waiting for the apposite weather, with acute shortage of skilled Media professionals worrying the owners and producers in Television and Film industries, Advertising and PR Agencies. The digital industry is hungry for absorbing students possessing technical expertise and Cinema for actors, directors, lighting and sound designers along with line producers and marketing managers. Even as there is no dearth of job opportunities in these areas, the Centre too is not lagging behind in offering the required talent matching their demands. Considering all this, Punjabi University took the initiative of setting up only-of-its-kind in the country an independent Centre for Advanced Media Studies (CAMS) to start new kinds of technical, professional, advanced and specialized courses to befittingly train students for a plethora of jobs awaiting them in the glamorous Television and Film worlds. The Centre now runs B.A. (Hon's) in TV and Film Production ; B.A. (Hons) Course in Journalism, Mass Communication and Media Technology, MA TV & Film Production and Ph.D. programmes. Another exclusivity of Punjabi University, Patiala, lies in the fact that it has been chosen to establish an Educational Multimedia Research Centre (EMRC) by the UGC and MHRD. . It is now one of the 22 such Centres spread across the country and the only one, covering the States of Punjab, Haryana, Himachal Pradesh, Uttrakhand and Union Territory of Chandigarh to impart electronic and digital education based on the 'reaching the unreachable' and 'beyond the classroom' concepts of education to provide quality education at the doorsteps of the students. Production of educational programmes (especially e-video and e-content) and setting up of appropriate facilities for this. Carrying out research related to optimizing the effectiveness of these programmes. Providing a forum for the active involvement of reputed academicians and scholars in the creation of appropriate educational programme. Studying, promoting and experimenting with new techniques / technology that will increase the reach and effectiveness of electronic and digital communication. The AVRC was rechristened as Educational Multimedia Research Centre in 1991 to enhance the curves and contours of spreading education, taking along with it the marginalised section of the society of students, who could not afford to join their counterparts enjoying the privilege of regular classroom system of education To meet the laid down objectives, the Centre engages the stakeholders in order to produce the quality educational content for both the broadcast and the online medium. The Centre is now an essential part of the SWAYAM Project, wherein a student/learner can increase his/her knowledge based upon the anywhere anytime concept of learning at the undergraduate level. It is also one of the 32 DTH anchor institutes, including six of the 21 Media Centres, chosen by the MHRD under its SWAYAM Prabha DTH umbrella for providing quality education through the broadcast and digital media. We are now part of Information Highway, wherein the learner can access any information with just a click of the mouse. We are to work hard with constant zeal without any pit stops so as to create a niche in the new information world. The Publication Bureau, established in 1966 has a unique and important place in the academic life of the University. It has been publishing the research works, books and journals, produced by different departments of the University. The book van has been introduced by the university to make the university publications easily available to the masses. Internal Quality Assurance Cell (IQAC) was established on 1-8-1999 as per the guidelines of National Assessment and Accreditation Council (NAAC). For details please click the separate link provided for IQAC in Punjabi University website. The Directorate of Sports works for promoting Sports in the University and its affiliated colleges. It organizes Inter-College Competitions in various games and trains students for participation in Inter-University, National, and International Games. Well maintained infrastructure and facilities for games such as Archery, Athletics, Basketball, Boxing, Cycling, Fencing, Football, Hockey, Judo, Handball, Lawn Tennis, Shooting, Taekwondo, Table Tennis, Volleyball, Wrestling, etc. have been maintained. The University also has a large Gymnasium Hall for Indoor Games. It is one of the very few institutions in India to possess its own Velodrome and Synthetic Track. With a yearly day & night hard work, sports department has brought laurels to the Punjabi University by winning the most prestigious sports award Maulana Abul Kalam Azad Trophy 10th time. Near about 150 players have also been placed in various institutions and government departments. The Youth Welfare Department of the University organizes youth activities all round the year. The Punjabi University has won unique distinctions in Youth Festivals organized by the Association of Indian Universities in collaboration with the Ministry of Youth Affairs, Govt. of India; Directorate of Youth Services, Panjab; Directorate of Higher Education, Panjab and Panjabi Academy of Delhi State. Students of Punjabi University have had the privilege of representing India in the Festivals of India held in the former USSR, Mauritius, Spain, China, Germany and U.A.E. (Dubai). This department also organizes Hiking, Trekking, Mountaineering, Rock Climbing courses, and Youth Leadership Training Camps. The National Service Scheme is one of the most significant programme of the university. It inculcates the spirit of voluntary work among students and teachers through sustained community interaction. NSS plays vital role in personality development of student and upliftment of society. The major activities of NSS in the campus include special camping programme, environment pollution control, health awareness, blood donation, tree plantation, water conservation, cleanliness, AIDS awareness, skill development, self defence training etc We also organise Youth Convention every year since 2012. Health Centre has 2 doctors, 4 pharmacists, w staff nurses, 1 male nurse, 3 Lab Technicians, 1 radiographer, 1 ECG Technician and other supporting staff. Health Centre remains open for 24 hours a day, 7 days a week, even on all holidays and festival. We provide free consultation and free medicines to all the students of the University. Free consultation is being given to all the staff, faculty and employees of the University and their dependents. Free medicines are given in case of emergencies also. We are providing health care services in all Youth Festival, Sports Activities, Conferences, Seminars and NSS Camps. Laboratory Services- Laboratory of Health Centre is fully equipped with Cell Counter, Urine Analyser, ESR Analyser, and Biochemistry Analyser. We are doing all routine investigations like Complete blood count, Lipid Profile, Blood Sugar and Kidney and liver function Tests. ECG Facitlity- ECG is being done free of cost to students and at Govt. rates to the employees and their dependents. X-Rays- Digital X-Ray (COMPUTERIZED RADIOGRAPHY) machine is available her. X-Ray (Radiography) of the employees and their dependents are don at very nominal rates and free of cost to the students. X-Ray unit is registered with Atomic Energy Regulatory Board under Govt. of India. Bone Mineral Density- Bone Mineral Densitometer is available here. BMD test is done at very nominal rate. We are participating in national Programmes like Pulse Polio Programme. We are running Dots Centre under National Tuberculosis Programme. We are giving Health services to Meritorious School. We are giving full health care facilities to labour class and their families. Punjabi University has got authorization from Punjabi Pollution Control Board. Biomedical waste is generated in 5 Department other than health Centre for which a common collection point has been made in the health centre which is then sent to Ludhiana based authorized firm for further disposal. A Counseling Cell for students and employees of the University has been established in the University. This cell is monitored by the Department of Psychology. Multidimensional pressures of modernization and globalization are triggering psychological problems among students relating to their personalities, conduct and work. Unable to resolve the psychological conflicts and identity crises, many of them develop complexes and may seek solace in drugs or alcohol. Counseling and supportive psychological corporate houses and multi-national companies for making mass recruitments. Among these are included Infosys, Quark, Siemens, HCL, Satyam, Canon, Dabur and many others. There are six residential Hostels for boys and seven residential Hostels for girls. There are two (one for boys and one for girls) hostels at Guru Kashi Campus, Talwandi Sabo and two hostels (one for boys and one for girls) at Punjabi University Neighbourhood Campus, Rampura Phul. The strength of these four hostels is 550 for boys and 550 for girls. University College of Engineering has its own separate hostel facility. All the Hostels have wi-fi facility & CCTV Camera. The University Enquiry and Information Centre has been set up at the Main Gate to provide all facilities under one roof to the students and parents with regard to admissions, results, information regarding Distance Education and general courses, receipt of examination forms and canteen facilities. The Centre also provides computerized results to the students and handles enquiries of all sorts. The students also get counseling services during admissions. The Transport Department of the University runs a fleet of buses for linking the campus to various parts of Patiala city. Womens Studies Centre was allocated to Punjabi University by University Grants Commission under XI Plan, in August 2009 .Its main objective is the pursuit of a comprehensive critical and balanced investigation of the cause of gender disparity. The centre also aims at revitalizing University education bringing it closer to burning social issues and working towards their solutions. The Academic College has conducted many Refresher Courses in Orientation Courses, Workshops/Short Term Courses and Principals' Meet successfully. All these courses acquired National Character because participants were from as distant states as Goa, Karnatka, Maharashtra, Nagaland, Meghalaya H.P. Assam, Haryana, etc. The Academic Staff College is equipped with latest technological Gadgets, Guest House, Computer Lab, a lecture theatres etc. Department of Tourism, Hospitality and Hotel Management established in 2010 with a vision of a world class Hotel Management training centre with state of the art facilities and the best mentors for students in the field of Hospitality is all set to offer students Global perspectives and prepare them to face challenges in Hospitality and Tourism sectors. The Department can boast of its exclusivity in Food & B everage Production. The Department is being developed and managed by the individuals who have had industry experience in Five Star Hotels. The objective of the Department is to impart students with latest Hospitality knowledge, skills, concepts and management teachings to make them productive and professional for taking up leadership positions in Hospitality & Tourism sector all over the world. B.A. (Hons) Course in Journalism, Mass Communication and Media Technology, MA TV & film production and PG Diploma in Graphics, Animation and Special Effects. The latest milestone that CAMS has now achieved is signing of an agreement with Communications Studies and Integrative Media Department of Wilkes University, Pennsylvania, USA. Punjabi University Patiala established the Sophisticated Instruments Centre (SIC) in 2012 as a necessary and very important facility for carrying out the research work in the field of Life Sciences, Medical Sciences and Physical Sciences. The latest models of various scientific instruments like Scanning Electron Microscope (SEM), HPTLC, Flash Chromatograph, Real Time PCR, Thermo-cycler, Gel electrophoresis, Gel Doc System, Autoclave, Ultra-centrifuge, Ultra-Freezer(-80C), Spectrophotometer, Spectroflourimeter, and Florescent Microscope, etc. Have been installed in the SIC laboratories. The building of SIC was completed with grants from UGC during the 11th plan. Similarly SEM was also purchased with grant from UGC. Majority of the other instruments have been purchased with grant from DBT under the Interdisciplinary Programme in Life Sciences. A log book has been maintained and 8705 students have so far visited the centre while 7171 students. have actually used the facilities. A modern seminar room is also available in the centre. Similarly a Fossil Museum has been established in the centre which attracts lot of visitors. Most of these facilities are available free of cost to all research scholars of various departments of the University. This helps them to generate good quality data from their experimental work and they are able to compete at international level in terms of data generation from their research work. As per direction of the Hon'ble Supreme Court and guidlines laid down by UGC, Punjabi University, Patiala has "Prevention of Sexual Harassment of Women at Workplace Cell" to deal with issues of gender based harassment and violence on the campuses. The cell addresses the complaints of sexual harassment nature from students, research scholars, teachers and non-teaching employees of the various departments of the University, its constituent colleges, regional centres and neighbourhood campuses.